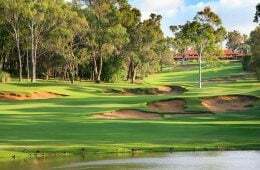 Best known for its collection of brilliant short holes, Yarra Yarra Golf Club is on track to return to its glory days. There’s a mélange of settings and styles at play at Pacific Harbour. The charmed run of Elanora Country Club within our biennial ranking was broken only by the club’s request to sit out the first three rankings of the new millennium while major course work was conducted and allowed to settle.